Each player is dealt 9 cards face down. The rest of the cards are placed in a draw pile also face down. Turn over the top card and place next to draw pile. The game can now start. The person to the right of the dealer starts play. You must work your way down from 9 to 0. So, if the first card is a 7 then the next player must lay down a 6, they can put down as many or few 6’s as they have in their hand. If they don’t have a 6 then they pick up from the middle. Unless they have a wild cars if they have a wild card and not a 6 – they must use this to replace it with! If they pick up a 6 from the draw pile, it can’t be placed down until their next turn. Then once a 6 has been placed, it’s the next persons go to lay down a 5. This continues until you get to 0, then you start back at 9 again. 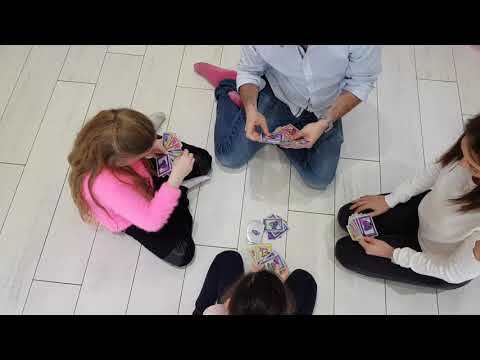 If the middle pile runs out of cards – you flip them over (without shuffling) and carry on the game. There are 2 wild cards that can be used as any number. If you can go, I.e have the next Number or a wild card, then you must go. The winner is the first person to lay down all their cards. Sounds simple – It’s not!